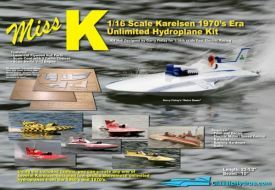 Miss K - A 1/16 scale unlimited hydroplane laser-cut kit from plans designed by Garry Finlay. Garry also developed the assembly instructions. Kit features lite-ply and 1/32 aircraft ply construction and includes a scale Merlin engine and a cowl kits with three tail fin designs making one of several hydroplanes. One of the photos shows an assembled unfinished kit with the engine and cowl and one tail fin configuration. 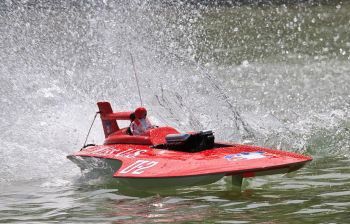 Overall Length 22.5, Width 10"
4420kv for 2s lipo, 2550kv for 3s lipo.